Dance with Me Bouquet with Red Roses is a hand delivered gift. These gifts are delivered by one of our local design centers located throughout the United States and Canada. Same day delivery is available for most gifts when ordered before the cutoff time. 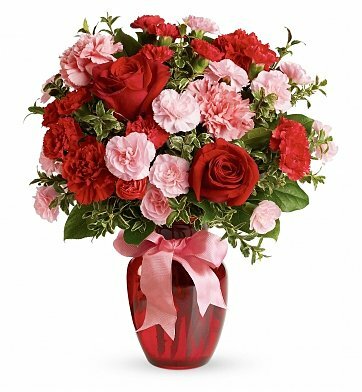 The cutoff time for Dance with Me Bouquet with Red Roses is 2 PM in the recipient's time zone. received on time daughter very pleased flower arrangement excellent very beautiful job well done will use this florist again in upcoming events. A nice bouquet delivered to my girl whilst I was in town brought a big smile to her face! Cincinnatti's 1 one stop flower shop went above and beyond to deliver flowers to my sister after surgery in Cincinnatti. When she checked out early from the hotel, they were able to delivery the flowers to her home address in rural Georgia successfully. Thank you so much one stop flower shop!